One of the most fascinating areas of rock ‘n roll history (for me at least) is the study of the various “lost” or “unreleased” albums by established rockers. Some have achieved legendary status, such as the Beach Boys SMiLE, the Beatles GET BACK or The Who’s LIFEHOUSE. Others, like the Kinks’ FOUR MORE RESPECTED GENTLEMEN are lesser known. However, most ‘well-educated’ rock ‘n roll fans will recognize the album by the Kinks called THE VILLAGE GREEN PRESERVATION SOCIETY. This album is argueably one of the Kinks’ best albums, if not one of the best in rock! It was basically ignored upon release since the Kinks weren’t touring America. It was also one of the first concept albums. This album actually saw two incarnations before becoming the cherished Kinks Klassic (sorry, can’t help myself with the ‘K’ spellings) that we know today. ‘THE VILLAGE GREEN’ album actually began with the working title, FOUR MORE RESPECTED GENTLEMEN. The project was originally envisioned by Ray Davies as a satire on English social etiquette. Much like the Beach Boys “lost” album SMiLE, FOUR MORE RESPECTED GENTLEMEN was given an official release number by Reprise (RS 6309). Unlike SMiLE, you can actually find ALL the songs from this “lost” Kinks album on official releases (see our appendix at the end of the article). So, unlike SMiLE, you can actually make your own copy of FOUR MORE RESPECTED GENTLEMEN and be pretty damn sure it is accurate. Sadly, the topic of this “lost” album is missing from most Kinks’ biographies. I searched through about eight of these and only found two, which mentioned this rare album. Those are: The Kinks - A Mental Institution by Johnny Rogan and The Kinks Kompanion by Jerome Wallerstein. Mr. Wallerstein was graciously allowed us to reprint the excerpt from his novel which talks about the (truly) great lost Kinks album. An excerpt from the novel"THE KINKS KOMPANION"
By mid-1968 tracks had already been laid down for two separate albums, one intended as a Ray Davies solo album, and the other for The Kinks’ next release. The Kinks submitted a 15 track album to Reprise Records in the US on June 28, 1968. The LP was submitted separately to Reprise (and not to Pye) because the band had re-negotiated their contract with the US company when they secured the representation of Allen Klein. A British release date of September was announced for the still untitled 12 track LP, intended for UK distribution. In this same press release it was stated that there would be a considerably different release for American audiences, and go under a different title of Four More Respected Gentlemen. In early August the band re-entered Pye studios to record one last track - a cut entitled “The Village Green Preservation Society”. Two weeks later, the third week of August, the final mixing was done and the tapes were submitted to Pye Records. Based on the strength and the overall appropriateness of this recent cut it was decided that it would be the title track to the album, which was now set for a September 27 release date. On September 21, Keith Altham of the New Musical Express reviewed the special pre-release tapes he was provided by Pye Records. No other magazine was afforded such a courtesy, which was a reflection of how close a friend Altham had become to the group - friends were hard to come by for the group these days, and it was an equally solid a gesture on Altham’s part to keep interest alive in the group. Altham’s tapes, we know consisted of some mislabeled songs. Just one week before this release Ray Davies changed his mind about the order and contents of the album and demanded that release be postponed. This was really a nervy request given The Kinks’ sagging financial fortunes, their uncertain drawing power and Pye’s tremendous patience and support during the arduous construction of the LP and the tumultuous months preceding it. Frustrated Pye executives saw it as the latest in a series of problems presented by the arrogant, moody, self-obsessed pop singer, but were in a quandary as he had made them so much money in the past, and there was a good deal of money already invested in the project. However, in another extraordinary show of faith, Pye compromised by allowing Davies to add three songs to the LP. Although it was too late to stop the presses in several countries, Pye managed to secure the return of the master tapes from UK record pressers before they manufactured and shipped albums to record shops. For years there existed a rumor that a few did leak out to record shops, but no copy has ever been brought forward to substantiate this. The master tapes had been released to various countries without the accompanying cover graphics, prior to Davies’ capitulation forced Pye to withdraw them at the last minute. For this very reason there exist a variety of covers for the original 12 track album depending upon the origin of the country where it is pressed. Not available commercially in the UK, album pressers in the various countries simply came up with their own locally designed covers (which in some cases were more interesting than the subsequent “official UK” release). Three countries (Sweden, France and Italy) featured a photograph from the same photo session on Hampstead Heath in London sometime the previous August. The New Zealand release, however, featured a photo which was from 1964; a shot taken of the group while in Hyde Park four full years and so very long ago. Many of the qualities of the four young men in the photo still existed in 1968, though in so very different a guise. 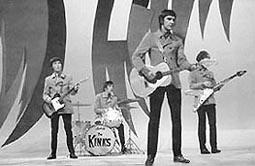 Davies submitted his final three songs for the LP in October, and Pye again issued a release date - the anticipated Kinks album was to be available early in the up-coming month of November, two full months later than originally intended. However, after considering their options with the material at their disposal, Pye decided not to release the separate and distinct album that The Kinks had intended for America (Four More Respected Gentlemen) issuing instead the new 15 track Village Green Preservation Society in January of 1969. Meanwhile in the US, Reprise considered how they wanted to package and present the album and were indecisive enough to allow three months to pass before finally deciding to issue Four More Respected Gentlemen. In a move worthy of Ray Davies himself, Reprise re-capitulated at the last moment (indeed, label copies had already been prepared) and decided to “re-engineer” the album by reducing its content to eleven songs. Four tracks were subject to Reprise’s knife, including Ray’s masterpiece “Autumn Almanac”, the unreleased oddity “Did You See His Name”, and two Dave Davies tracks “There Is No Life Without Love” and “Susannah’s Still Alive”. Reprise Records had already issued a catalog number (#6309), which indicates that the work considered a completed project. Reprise’s reasons for pulling the album remain unclear, but it is known with certainty that many of the cuts found their way onto the subsequent The Kinks Are The Village Green Preservation Society (which was the rumored Ray Davies solo project at the time). No final pressings of Four More Respected Gentlemen were ever manufactured, but original acetates were pressed. Rumor has it that Ray Davies is actually responsible for having held up the release of the album because he did not care for Reprise’s selection of album cover artwork. By the time Reprise was once again ready to release the album Four More Respected Gentlemen, the latest Kinks work from the UK surfaced and, because there were some duplicate tracks on both albums, Reprise decided to release the second, more recent piece instead of the former. Davies was not happy about Reprise’s decision to withhold release of Four More Respected Gentlemen, but had no power to over-ride such a decision. The tracks from this aborted album would surface later on The Great Lost Kinks Album (which was available for a limited time on vinyl) and The Kinks Kronikles, which served to fulfill The Kinks’ contractual obligation with the American company. A note of interest, as Doug Hinman points out in his esteemed discography: had Pye Records agreed to release Four More Respected Gentlemen as a double album in November, the release would have coincided with The Beatles’ White Album. It is wholly possible that such a notion factored into Pye’s reluctance to move forward with the idea of a double album (for to compete with The Beatles is to face the gods, and to fail). As quoted in Melody Maker, circa September 1967. A special thanks to Jerome Wallerstein for granting us permission to reprint excerpts from his Kinks' novel! I have included the song lineups for all the albums that are associated with FOUR MORE RESPECTED GENTLEMEN. Using official releases you can actually make your own copy of this rare album!